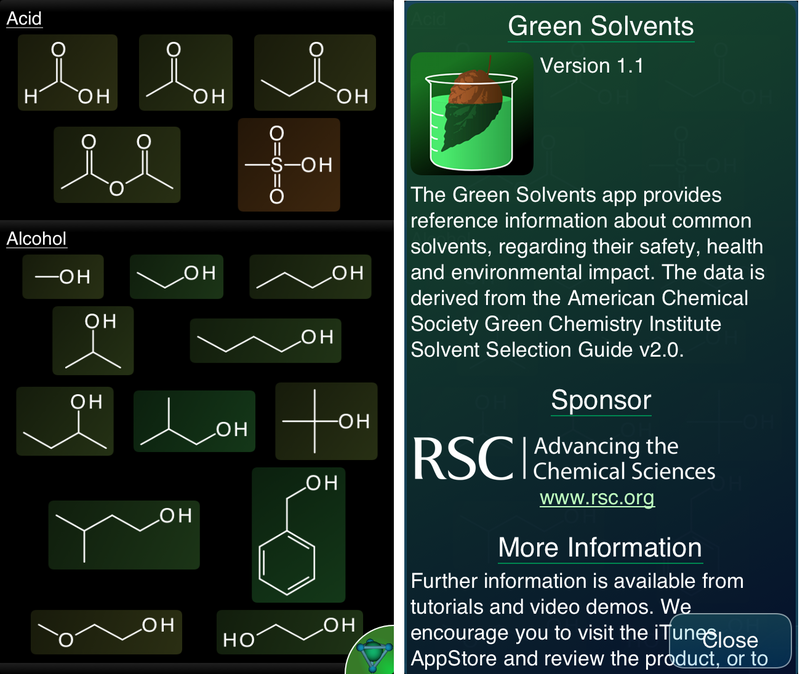 The latest version of Green Solvents (1.1) is now available on the AppStore. The first thing you’re likely to notice is that the banner advertising is gone. Take a closer look, and you’ll notice the acknowledgment that the app is now sponsored by the Royal Society of Chemistry. The Green Solvents app has been tied in with ChemSpider references from the outset. Given that the Royal Society of Chemistry owns ChemSpider, has a long standing interest in Green Chemistry, and an increasing role in the burgeoning ecosystem of mobile apps for chemistry, this is a natural progression. If you have an iPhone, iPod or iPad, check out the Green Solvents app: it’s free, and it couldn’t be any simpler to use. And stay tuned for further announcements, there are more on the way!